Too many photos to import. I will make some direct one on one comparisons as we go. There is definitely something off with the PSIA Team. Is it technique or alignment or both. It's both, most of the US skiers have bad alignment and their movements are'nt really efficicent for modern skis. That is really not very good skiing from the US team by any measure-- whether the measure is PMTS or TTS or "just skiing". I remember in the late 80s and early 90s the National Demo team had some excellent athletes and skiers (male and female) and there were many talented skiers on the Division level demo teams. Last edited by ComprexX on Sun Sep 13, 2015 5:04 pm, edited 1 time in total. The alignment is terrible on 8 of ten of the PSIA skiers, they are way off. Even the Austrians have a few that are "A framed". The PSIA Demo, their skis are too wide and they can't get them on edge, they are pushing their skis around on flat bases, not tipping them. The only ones using PMTS are Diana and me, and the best of the Austrian group. Do you notice any skiers with the inside ski not tipped as far, or flatter than the outside ski? Yes that because they don't understand the movements that create a release or where a turn starts. It's still the old traditional technique by traditional ski school. I should have been more clear--my comments were directed at the US PSIA Demo team skiing, sorry I was'nt more specific. It looks like most are turning by using CA and CB with a back seat hip dump. MarcS wrote: It looks like most are turning by using CA and CB with a back seat hip dump. If you're referring to the PSIA teamers, they show very little CA or CB. Some actually exhibit negative CA. One almost attains negative CB! Doug, I agree with you about your comments. Haralds comments have got the PSIA members upset. I noticed on the PSIA teaching ideas forum, a chain of people attacking him for his comments about the demo team. Funny they only attack because the true hurts and their skiing is not anywhere close to the PMTS level of skiing. On the issue of alignment since they use wide skis and rotary with a wide stance they don't spend much time with alignment. Great that us students can see the bad skiing. DougD, you are right on the mark with your analysis. Most are rotated and two footed. 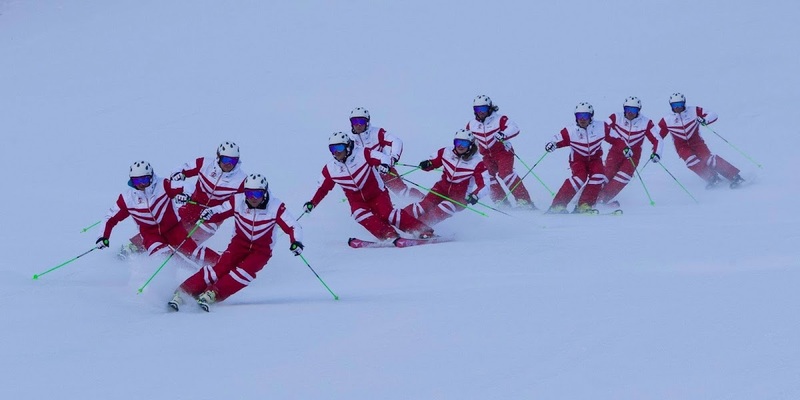 Here you can see the Austrians, although far more dynamic than the PSIA group, they have a few pinched knees as well. However they have a few guys that look like PMTS. The only real difference for the two good ones is in the upper body pole use, they have at the dreaded high elbow, and that leads to rotation at the finish. Look specifically at the last skier. His elbow is up, now look at the rest of the skiers with the high elbow, they are leaning and have an "A Frame". The first one looks totally PMTS. He is also the closest to Richie Berger's skiing. h.harb wrote: DougD, you are right on the mark with your analysis. Most are rotated and two footed. Harald, thanks for that. More important, thanks for developing and publishing a skiing analytic that lets even non-expert skiers perceive what's actually happening in many skier photos/videos. I only wish I'd found PMTS 30 years ago. I almost had to cancel for Short Turns 1 due to a work conflict, but that's been resolved. I'm not too proud (actually, I'm eager) to have you deconstruct MY skiing. Jim, as you know, an instructor who's afraid of criticism is an instructor who's stopped learning. I lost interest in "teachers" like that somewhere around 3rd grade. Doug you are completely right, I was just trying to determine how they can actually initiate turns without PMTS foot movements. That is an easy one, they push off, extend and steer, then they rotate, push the skis out, drive the outside knee and start over. This is not wold class ski technique, it's old, national ski school, type systems. Just think that these are the highly motivated few who have spent countless years perfecting inefficient intermediate turns. So much of their ego and identity is invested that it is no wonder they are so defensive and angry when you point out that their skiing is mediocre. A+ for effort, D for skiing. So sad, I feel sorry for them. 1. Have students put their poles behind their knees, grip them from the front of their knees, and as they ski, slowly turn across the fall-line. 2. Leaving their poles behind, have students cross their hands across their knees (left hand on right knee and vice-versa), and perform the same action. 3. Hold poles across the front of the knees and perform the same action—using hands to steer the knees into each turn. The sensation from each task is immediate, and offers a strong first sensation of the act of carving. Apparently, even the Austrian school is teaching knee driving with upper body rotation. Sad, they don't seem to be able to analyze what world cup skiers do. They need to learn PMTS, now it is so apparent to see the difference with extending to release, leg steering and the lack of CA, CB. I feel bad for the students on the race team at our mountain when the coaches tell them to point their knees into the direction of the turn they want to go.